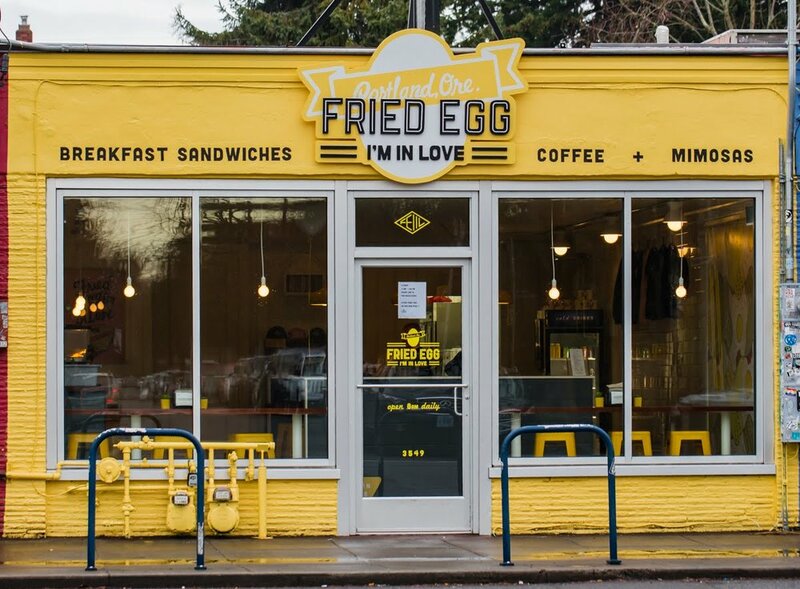 Fried Egg I'm In Love makes Portland's best breakfast sandwiches. Each fried egg sandwich has a punny name, a perfectly cooked egg, and is crafted with love. We also have the best gluten-free breakfast sandwiches in Portland. Our vegan breakfast burrito is immensely popular, and everyone (even carnivores) LOVES our house vegan sausage--made from gluten-free oats, polenta, and veggies. Our full-service Hawthorne restaurant offers Stumptown hot and cold coffee, not to mention mimosas, local beers, and hard ciders. Not to mention awesome breakfast sandwiches and hashbrowns. And now, you can get a breakfast sandwich in downtown Portland by visiting our yellow food cart in Pioneer Courthouse Square, voted “Best Place to People Watch” by the trusted FEIIL staff. We think our breakfast sandwiches speak for themselves, but we also pride ourselves on providing fantastic customer service, and a 100% uniquely Portland experience. They say "Keep Portland weird" -- we are certainly doing our part. We can also take care of your Portland breakfast catering needs. You can get Portland's top breakfast sandwiches made just for your event. Whether it's a catered corporate breakfast, music festival (we like those! ), or a day-after-the-wedding hangover breakfast, we can work something out. Email friedegglove@gmail.com to get started on your breakfast catering order today. Our food is great on the go, but you can also sit down and enjoy your sandwich on site. At our Hawthorne restaurant, you can grab a mimosa and do some people-watching at the window, or admire the radical chicken-and-egg tessellation by Rather Severe. At our Pioneer Square location, you will get a taste of downtown Portland. Witness all the activity happening in what we call "Portland's Living Room." Get your food and find a spot on the steps to take it all in. We also offer some covered spots in the winter so you can eat without getting rained on. We also offer a convenient to-go option; to place an order for pickup, just call 503-610-EGGS (Hawthorne) or 503-704-FELT (Pioneer Square). PLEASE NOTE: on weekends and holidays we no longer answer the phone at Hawthorne due to heavy in-house demand. And if you're just too lazy to get out of bed, use POSTMATES app to have a courier deliver fried egg sandwiches to your door! We partnered with the most well-known coffee makers in Portland to bring you a variety of caffeinated products that will start your day right. Freshly brewed hot coffee awaits you each morning, and for a change of pace, we also offer Stumptown Cold Brew stubbies, and Stumptown Cold Brew with Milk (seasonal). We love interacting with our fans and followers online. Follow us on Twitter, Facebook, and Instagram and join the fun!